The MKX 18-55mm T2.9 Lens & Hoya 82mm NXT Plus UV Filter Kit from B&H pairs the cine-style zoom with an 82mm UV filter that reduces any unwanted blue cast and protects the lens front. 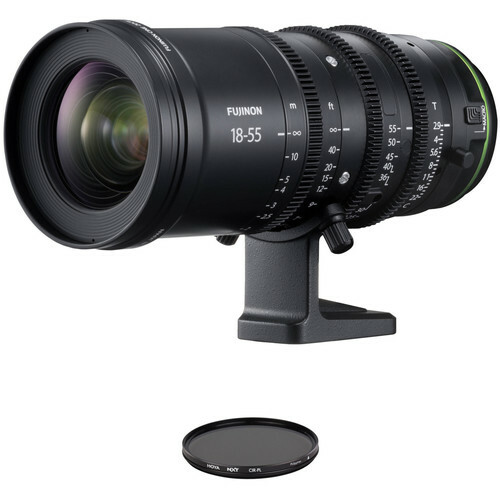 The Fujinon MKX18-55mm T2.9 Lens in X-Mount is a lightweight cine-style zoom lens for X-mount cameras with a Super 35mm-sized sensor. The electrical contacts within the lens mounts allows communication with X-series cameras. It features a mechanical design with three independent lens control rings: focus, iris, and zoom. Each ring incorporates a cine-style gear with a 0.8 MOD for interfacing with standard cine -style lens accessories. The focus ring features approximately 200° of rotation, which provides room for precise focus pulls, and the iris is clickless, enabling smooth iris pulls. The lens also incorporates a macro mode for close focusing capabilities. The lens is color matched to other Fujinon lenses such as the HK, ZK, and XK series, which enables smooth intercutting between lenses. The 85mm front enables use with many cine-style matte boxes via use of optional step-up rings (rings not included). The lens weighs only 2.16 pounds, which is fairly light for a cinema zoom that holds focus and aperture throughout the focal length range. It is designed for cameras with a Fuji X-mount, so it has a short flange focal distance, but the lens allows for flange focal distance adjustment so you can fine-tune it to the camera you are using the lens on. The electical contacts within the lens mount enables communication with X-series cameras, which allows for correction of distortion and color/brightness shading to prevent vignetting. This communication also enables you to achieve a variety of color expressions when using Film Simulation modes. The Hoya 82mm NXT Circular Polarizer Filter helps to reduce reflections and glare by filtering out light that has become polarized due to reflection from a non-metallic surface. The light from the sun naturally becomes partially polarized due to reflecting off electrons in air molecules, causing the light to scatter into what appears as haze. A polarizing filter arranges, and filters, this directionally polarized light perpendicularly to the reflected light, allowing for the absorption of much of this light. This results in a noticeable reduction of glare and reflections from non-metallic surfaces and an increase in the saturation of skies and foliage. Box Dimensions (LxWxH) 15.1 x 7.5 x 7.45"
does it come with the lens hood? Product is listed to come with a lens hood.